This image of the Small Magellanic Cloud (SMC) is a collaboration between me and Brett Soames, of Bathurst, New South Wales, Australia. Brett acquired the image data from his home observatory and did the pre-processing (calibration, alignment and integration). I did the processing as described below to produce the picture you see here. The SMC isn’t visible to me at my observatory’s location; it is a Southern sky object. 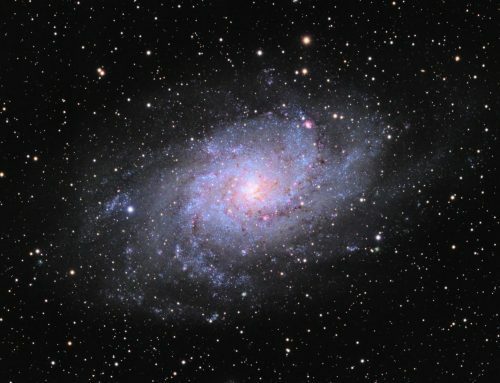 The SMC is a dwarf galaxy containing several hundred million stars. 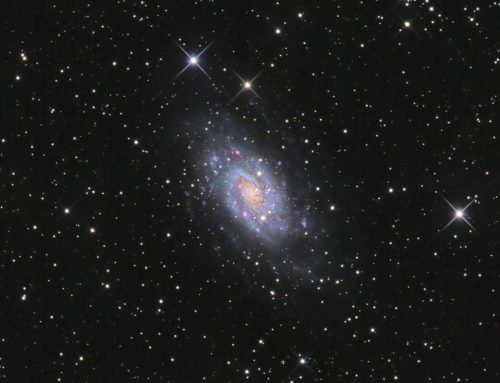 It is one of the nearest galaxies to the Milky Way at around 200,000 light years distant. It is easily visible to the naked eye in a dark site. I saw it once low over the ocean in Costa Rica and at first I thought it was a cloud! For scale, the width of the SMC in this image is around 10x the width of the full moon. This image shows numerous reddish emission nebulae as well as blue reflection nebula and both open and globular star clusters similar to those in the Milky Way. I encourage you to click on the image above, and then click again to get the full magnification view. You can explore the many clusters, nebulae and dark patches in the SMC. The two blue patches at left are NGC346 (right) and NGC371 (left). Both are open clusters surrounded by nebulae containing abundant oxygen, which gives then their colour. 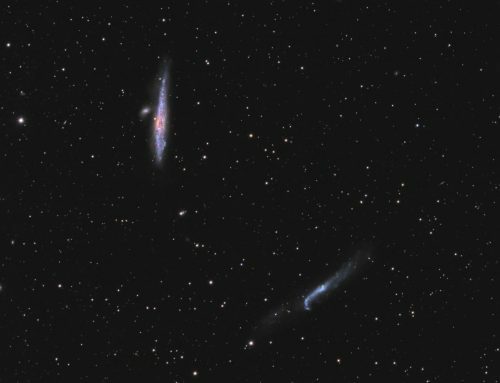 According to Ian Cooper, co-author of Imaging the Southern Sky, these nebulae in the SMC are less obstructed by dust than similar objects in our own galaxy. While the dust in our galaxy tends to redden our view of these objects this isn’t true when we look at nebulae in the Magellanic clouds, so they are distinctly blue. To the lower left of NGC371 are a couple of red emission nebulae. 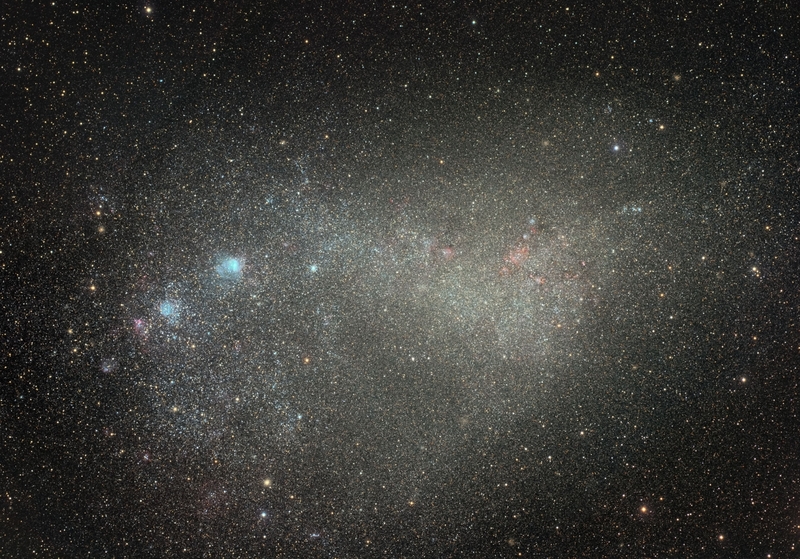 To the upper left of the blue nebulae is globular cluster NGC362, and below them are two more small globulars – NGC416 and NGC419. 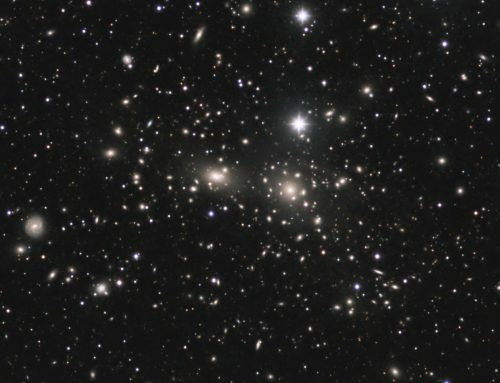 Towards the right centre of this image are several red emission nebulae (NGC248, NGC249, NGC261 and NGC294) involved with star clusters. You’ll find many other dense star clusters above and below these pink regions. In spite of its name, the SMC was not discovered by Magellan. These clouds are so easy to see with the naked eye that they have been described in the lore of southern indigenous people for eons. SBIG STL-11000M camera, Astrodon Gen2 LRGB filters, Takahashi FSQ106, Paramount ME, FLI Focuser and Pyxis rotator. Guided with STL-11000’s internal guider. All pre-processing and processing in PixInsight. 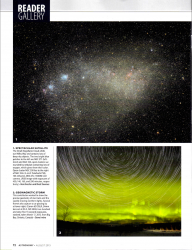 Brett Soames acquired the data from his observatory in Bathurst, New South Wales, Australia. Cleanup: The cropped L,R,G and B masters were combined to produce a synthetic Luminance channel. DBE was applied to neutralize the background. Small-scale structures were isolated by making a copy of the image and applying HDRLinearTransform with 4-layers and residual unchecked. Large-scale structures were isolated by subtracting the small-scale image from the LHaRGB (no rescaling). Contrast was boosted in the large-scale image. Colour saturation was boosted in the small scale image. A mild unsharp mask was also applied to the small scale image. Then small-scale and large-scale images were added back together in PixelMath. Image scale for this telescope camera combination is 3.5 arcsec per pixel.